Great news for all of you design enthusiasts out there: TOWER ONE is taking Mail Designer Pro to a whole new level. Mail Designer 365 is the ultimate new subscription model solution for professional HTML email design. Under the TOWER ONE brand, we aim to transform Mail Designer 365 into one of the world’s best email newsletter design services and create an easy-to-use, productive tool for creative professionals and email marketers everywhere. Here at TOWER ONE we are always thinking about the future and how to provide the optimum user experience. Many of the most popular feature requests received by equinux (such as countdowns, analytics, image hosting etc.) require a cloud-based service to work. As part of TOWER ONE, an equinux company with cloud experience, Mail Designer will be improved with ongoing services for cloud features, as part of a subscription model. Mail Designer 365 offers you continuous feature updates throughout the lifetime of your subscription, and always provides complete compatibility with the latest macOS. The new version is perfectly optimized for great performance with macOS 10.13 High Sierra. Subscribers can also look forward to an exciting development roadmap we have planned for the next 12 months; containing updates for design tools, creative content, cloud services, and more. #MadeForDesigners – Mail Designer 365 reaches new heights with an array of brand new layout and design features. Drag and drop ready-made layout blocks to create complex designs in minutes or save and reuse your own creations with the brand new custom layout blocks feature. #MadeForCreativity – Professional image editing tools and photo-filter effects allow you to express your creativity right here inside the app. With just one click you have access to a world of effects such as brightness, contrast, sharpness and 10 unique filters for stunning newsletter designs. #MadeForSmartphones – You can easily use Mail Designer 365 to adapt your designs for the newest mobile devices on the market – including the iPhone 8, iPhone X, and Google Pixel. #MadeForYou – We designed the new and improved UI especially with you in mind. Larger icons and a search & sort feature help you to find your designs instantly and the brand new Mail Designer 365 News platform provides you with expert design tips and marketing know how. And there’s even more… See the complete list of features here! 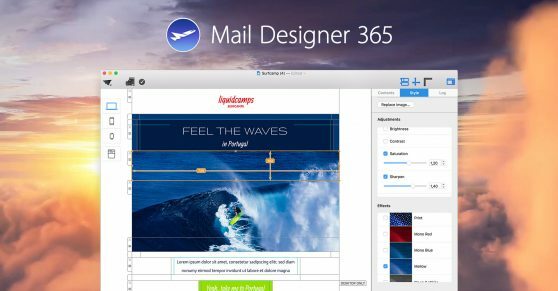 You can purchase Mail Designer 365 today from our website or from the Mac App Store. Simply install the app and choose the plan for you to get started. Hey existing customers! If you are already a Mail Designer user, you benefit from an exclusive upgrade offer. Discounted plans start from just $49.99 a year! Lock in your discounted price before October 31st and enjoy your lifetime discount.